Many people forget important things in their life, because it is importent for them, nothing to forget. On the following pages I would like to give you an impression of my work as a painter. Please enjoy my paintings and maybe - sometimes there is a picture I painted for you in my gallery. Here you can find inspirations for my individual online offers. Would you like an induvidual portrait, with pleasure a portrait of a dog or your pet? 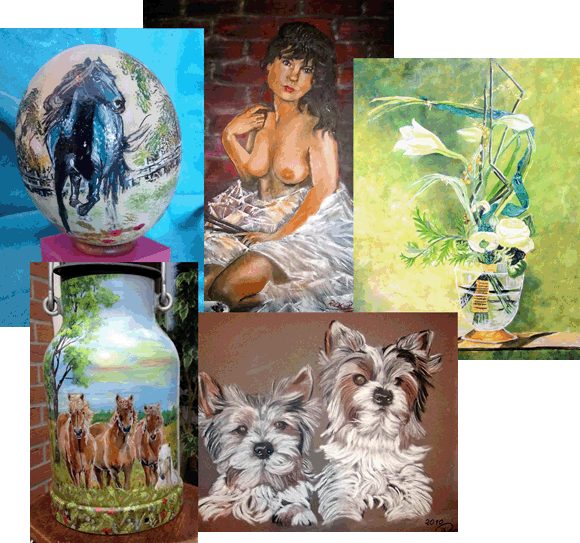 Or you would like to get a painted milk can or a painted ostrich egg? Here you can find a lot of inspirations for your own imaginations. Realize the beauty and the magic that surround us. A landscape picture can fix a magic moment. The beauty of flowers may joined also to their relaxing silence. Your own still life picture can give you calmness and harmony. A portrait helps us to remember to a unique person. You can look back to a beautiful moment in your life. ... my online offers for portraits. Dogs are our loyaltiest accompanies. They give us their whole trust. We should never abuse this trust! ... my online offers for animal portraits. Maybe your netx present is a painted milk can with a nice picture of your homeland. ... my online offers for painted milk cans. You have the idea of a personal motive on an ostrich egg or goose egg? I could make your idea true. ... my online offers for painted eggs.